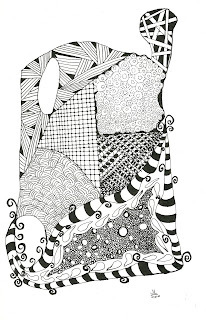 I first saw zentangles online. I began seeing them on Momentile where Kit and Heather began posting their work as their daily photos. I was taken by the lovely drawings they were making. The simplicity, clean lines, and patterns pulled me in and I began to think that MAYBE I could try my hand at such things. So, I added a few sketch books and pens to my wish list hoping that maybe I'd get some for Christmas. My husband got me the sketch books, I got some pens and I was off! At first I was just wondering in the dark a bit. I checked Kit's blog for inspiration, the official Zentangle web site and blog for guidance and set out. This is my first tangle. Well, the first that I will admit to. At first I felt a bit lost and that I needed some guidance in this process. So for help, I ended up ordering Totally Tangled by Sandy Steen Bartholomew from Amazon. The book gave me the basic starting points, how-to for patterns and the confidence I needed to move forward. While this first tangle doesn't follow the standard for a zentangle, I was happy with it. I learned how to get started and how to make some tangles. From there, I was hooked and now I can't stop! I draw almost every day and often too late into the night. I'm hooked on the sense of accomplishment the tangles give me. Knowing that I have tackled a new pattern that I didn't think I could do is empowering. Completing a new tile gives me something that I can hold in my hand and show others what I have done. 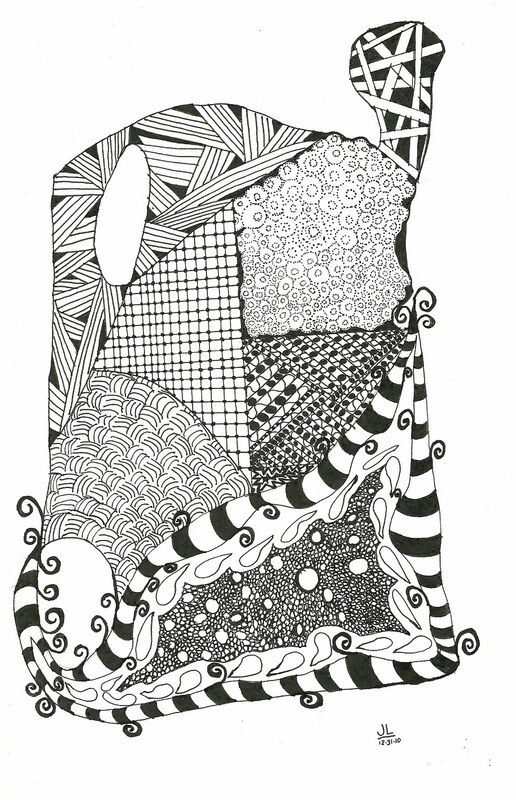 Of course, the feedback from friends, family and the zentangle community is ADDICTING! Talk about validation! I am a total junky now and I have no regrets.